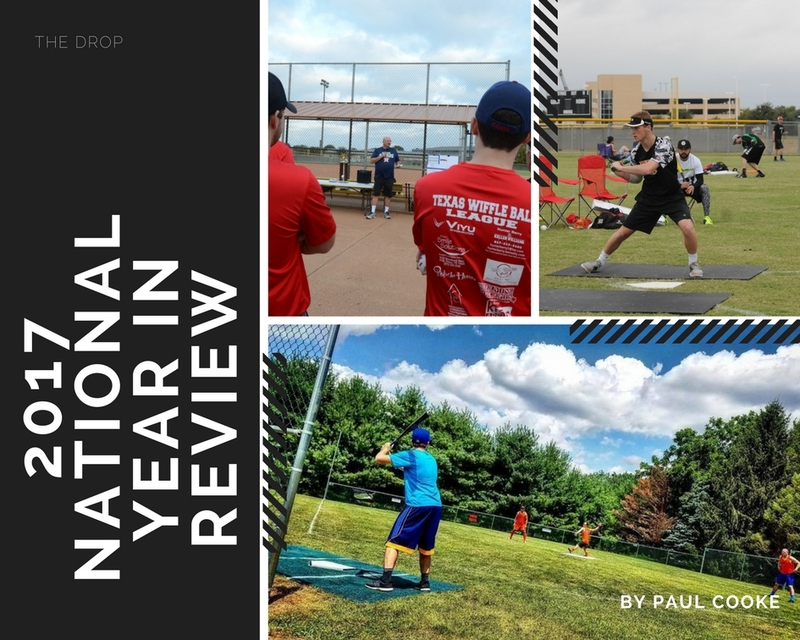 The DROP takes a look back at some of the major happenings during the 2017 year in Wiffle® Ball. Coming later this January, a discussion on what is in store for 2018 and what we would like to see happen in the world of Wiffle this upcoming year. At the end of the 2016 season, Billy Owens dipped his toes in the water in testing out a Fast Plastic revival when Fast Plastic co-sponsored the Hall of Fame Classic in Massachusetts with the Golden Stick Wiffleball League. However, it was in 2017 that the one-time premier national Wiffle® Ball organization made a full-fledged return when it hosted the Texas Open in late October. The tournament drew 15 teams from several different parts of the country. Among the states with representation at the tournament were California, New York, Georgia, Arizona, Nevada, Texas, Massachusetts, and Pennsylvania. The tournament field was an eclectic mix of veteran players and teams that hadn’t been heard from in recent years, several of the game’s current top players, and a handful of eager (and talented) Texas-based squads. 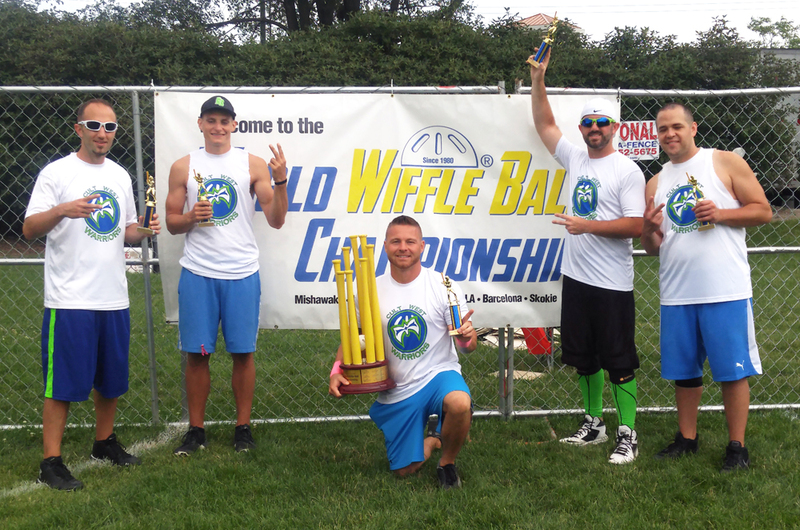 The $5,000 cash prize awarded to the champions, Cloud9, was the biggest purse of the year in competitive Wiffle® Ball. Fast Plastic has plans to bring back the Texas tournament in 2018. There are several players who stood out in 2017, not only through quality play, but also by showing up to play in a variety of leagues and tournaments. Jimmy Cole asserted himself well on both sides of the ball in 2017 between the AWAA, Palisades WBL, the NWLA tournament, and the Fast Plastic Texas Open. At the plate, Cole proved himself adept at reaching base posting a .466 OBP in AAWA, .594 OBP at the NWLA tournament (5th best), and .359 for the Palisades Cardinals (14th best in the league). On the mound, Cole has the innings and stats of a very good “round robin” pitcher. He got most of his work in AAWA where he pitched a 2.76 ERA over 32 2/3 innings, but also worked 18 innings between Palisades and the NWLA tournament while allowing ten total runs. Ty Wegerzn was named the Palisades WBL Rookie of the Year and with good reason. Ty finished atop most of the offensive categories including 2nd in batting average (.320), 3rd in OBP (.443), 2nd in slugging (.598), and 2nd in homeruns (10). He worked the fourth most number of innings (59) out of all Palisades pitchers with a solid 2:1 K/BB ratio and a 2.20 ERA. Outside of Palisades, Ty was solid in his one GSWL tournament of 2017 but made a huge impression at the Fast Plastic Texas Open for the champions, Cloud9. Ty was arguably as important to Cloud9’s run to the title as anyone on the team, including tournament MVP Sean Steffy. Ty started every single one of Cloud9’s four round robin games. He went 3-1 and more importantly, allowed Steffy to enter the elimination round completely fresh. Ty carried an upper 80’s riser during the tournament and added a backbreaking RBI hit against Wiff Inc. in the semi-finals. Speaking of Wiff Inc., Jordan Robles was the iron man of 2017. Robles had a significant presence in Palisades, GSWL, Mid Atlantic, and the Fast Plastic Texas Open this past year. The proof of his individual impact can be found in the success his teams enjoyed. Jordan played for the New York GSWL champions (10 Run Rule), the runners up in GSWL Yard Open Tournament (Founders), the Mid Atlantic Wiffle champions (Stompers), the 3rd place regular season and post-season Palisades team (Padres), and the 3rd place team at the Fast Plastic Texas Open (Wiff Inc.). Jordan was truly a two-way star in 2017 combining above average power and patience at the plate with unrivaled command on the mound. His success in both the medium pitch GSWL Yard tournaments and unrestricted pitch tournaments/leagues is an additional feather in his cap. Other players that succeeded at a high level in multiple environments in 2017 include (but are not limited to): Will Marshall (Texas Wiffleball League, Fast Plastic), Rob Longiaru (GSWL, Palisades WBL, Fast Plastic), Ben Stant (GSWL, Mid Atlantic, Palisades WBL), and Ryan Bush (OCWA, NWLA, Fast Plastic). After several years of scaling back on fast pitch tournaments in favor their Yard League (“medium pitch”) format, GSWL did not hold a single fast pitch tournament in 2017. It appeared inevitable that GSWL would eventually end up in this position, particularly after hosting only a single fast pitch tournament in 2016. However, the switch over entirely to the Yard format was perhaps quicker than most anticipated. The New England based organization announced a fast pitch tournament for September on their original schedule, but cancelled the event over the summer. As such, 2017 marked the first time this decade that Golden Stick did not hold at least one fast pitch tournament. In a bit of good timing, Fast Plastic’s return to the tournament scene with October’s Texas Open helped fill that void. On the Yard League side, GSWL trucked right along on similar path to prior years which included a series of “qualifying” tournaments in Massachusetts and New York, separate Massachusetts and New York playoff tournaments, and an open style tournament to cap off the summer. The New York opener (18 teams) and National Open tournament (22 teams) were among the more heavily attended non-slow pitch tournaments of the year. Continuing another trend, GSWL tournaments – even the ones labeled as playoffs or championships – were essentially all standalone events without much in the way of continuity to tie them together. The attempt at bringing other tournaments and even backyard games into GSWL’s larger structure never really seemed to take hold. Going into 2018, GSWL is still arguably the most prolific organization in the game – their latest media attention coming in the form of a VICE Sports piece – even as they trend more and more towards being a medium pitch, standalone tournament organization only. On July 30th, the Cult West Warriors out of South Bend, Indiana outlasted a field of 80-teams to capture the Hometown Cup at Migley Field in New Carlisle, Illinois. It is the fourth time that the Warriors have held the Cup in the past five years, further cementing their status as the most prolific team in an event that dates back to 2005. Just two weeks prior to their most recent Hometown Cup championship, the Warriors finished first out of 48 teams in the 38th annual World Wiffle® Ball Championship in Skokie, Illinois. It marked the second year in a row that the Cult West Warriors won the world’s longest running national Wiffle® Ball tournament. The Cult West Warrior’s success in these large slow pitch tournament fields certainly gives them a rightful claim to be considered the best slow pitch team in the country. To some players, that might not seem like much of an accolade. Slow pitch Wiffle® Ball is often brushed off as being an unskilled game because it essentially removes the competition between pitcher and hitter. Indeed, under the rules of each of the aforementioned tournaments the pitcher is required to throw the ball in a manner to allow the batter to hit it. The natural reaction to these rules is to declare that there is no skill involved. That is a largely a fallacy; there are skills involved just different ones than those found in a fast pitch environment (and perhaps, more easily attainable skills). If nothing else, the sustained success of a team like the Cult West Warriors supports the idea that there is skill involved in the slow pitch game. Teams cannot consistently win in fields that large if the game is all or mostly void of skill and all or mostly a function of luck. On August 27th in Staten Island, New York State of Mind won a hotly contested nine-inning battle with the Founders to capture the 2017 GSWL Yard Open tournament. The victory was arguably the biggest in the almost twenty years that the franchise has been in existence. One the sport’s most enduring teams, State of Mind made deep runs in several years – a second place finish in the 2002 USPPBA season among them – but found that one big tournament title to be elusive. For Jay Ventresca – one of the game’s all-time great hitters and the only original SOM member remaining – it is another major accolade to a packed resume. State of Mind’s old foes from the 2002 USPPBA season, the Stompers, also enjoyed success in 2017. Returning after a lengthy absence, the Baltimore based squad won two of the five regular seasons Mid Atlantic tournaments and then swept the playoffs to capture the inaugural MAW title. The Stompers received a big late season boost from Jordan Robles who led the team in the September regular season tournament and again in the playoffs. Nick Schaefer proved that, when healthy, he is still one of the best pitchers around by holding opponents to just four runs over 29 innings of work. The Stompers franchise celebrates its twenty-year anniversary in 2018. At the Fast Plastic Texas Open, several veteran teams likewise proved that they can still go. 2007 Fast Plastic Champions, GSW, fought to a top 4-finish in the tournament behind another tremendous performance from one of the game’s all-time great pitchers, Joel DeRoche. The Rookies – the 2006 Fast Plastic Champions – also turned back the clock making it all the way to the championship game before being stopped by the eventual champions, Cloud9. The NWLA hosted its sixth national tournament in Morenci, Michigan, with familiar faces atop the table. For the second straight season, the SWBL Cardinals made it to the championship game via the loser’s bracket only to come up short once again in the finals. After a third place finish in 2016 coming off of back to back titles in 2014 and 2015, the WSEM Dads returned to their winning ways this year. The team from Michigan captured their third championship on the strength of another dominant pitching performance by Stephen Farkas. Conspicuous by their absence in the final four was the 2013 and 2016 tournament champions, Freaky Franchise. The OCWA group lost team captain Justin Tomkins to injury and never got on track, losing two games in pool play before being unceremoniously eliminated in the third game of the elimination round. On June 10th in York, PA, Connor Young (My Name is ERL – Mid Atlantic Wiffle) pitched 25 innings while facing 102 batters and struck out 71 of them. ERL's ace allowed a measly three runs against quality competition. For good measure, Connor hit a pair of homeruns including a tournament winning solo shot off of Danny Lanigan in the tournament finals. Ridley Park’s Tommy Loftus faced 68 batters over 3 games (15 innings) at the NWLA tournament in July. He struck out a remarkable 44 batters or 65 percent of the batters he faced. It was a star making performance for Loftus that put him on the map as one of the young pitchers to watch in 2018. Also on the NWLA tournament front, Stephen Farkas furthered his claim as one of the game’s most accomplished pitchers allowing one run over 22 innings pitched and striking out 53 batters while leading the WSEM Dads to a third NWLA title. Unfortunately no statistics are available, but Sean Steffy’s pitching performance during the elimination round of the Fast Plastic Texas Open is worthy of mention. Facing a murder’s row of great hitters including Craig Freeman, Kenny Rogers, Anthony Didio, Jordan Robles, Evan Lazur, and Josh Pagano, Steffy won three straight games to clinch the title for Cloud9. In one of the more under-the-radar great pitching outings of the just concluded year, Jordan Castelli (Wiff is Life League) befuddled hitters at the 10th annual Wiffle® Ball Bonanza charity tournament in July. Playing on a combined Mid Atlantic Wiffle/Wiff is Life League team, Jordan used a non-scuffed drop pitch to dominate opposing hitters in the semi-finals. Jordan struck out all twelve batters he faced. He was so dominant he took home the award for best pitcher on the strength of that single performance. Although he had a slightly uneven performance at the NWLA tournament, the California University of Pennsylvania quarterback is a player to keep an eye on in ’18. When the general public thinks of Wiffle® Ball, they often think of offensive stats so silly that they must be made up. There was nothing fabricated about the power display from Freaky Franchise’s Ryan Bush in in OCWA this past season. The left-handed power hitter managed a ridiculous 109 homeruns over 341 at bats. While OCWA is no doubt a hitter’s league, Bush’s 109 homers were almost forty more than the next best player in the league. Bush’s power is legit – he hit 8 homeruns in 28 at bats at the NWLA tournament this year, 6 in 44 at bats in Palisades in 2016, and added a few more at the Fast Plastic Texas Open in October of this year. The Wiffle world has been trending in this direction for several years and 2017 proved to be another year that was heavy on leagues and light on tournaments. The end result for 2017 – while not necessarily positive or negative – was a plethora of thriving local leagues but little interaction between the leagues and the players that inhabit them. Once again, Palisades WBL separated itself from the pack as the best league in the country. While the league continues to draw heavily from New York, players from as far south as Delaware and Virginia and as far north as New England flocked to Palisades in 2017. The league ran a smooth 11 team, 20 game-schedule with many of the game’s best prime-aged Northeast players spotlighted. For the second straight year, Palisades hosted an 8-team minor league which gave players not quite ready for the majors – either due to skill level or time constraints – a venue to play in. It should noted that on the tournament front, the birth of Mid Atlantic Wiffle and the return of Fast Plastic provided several more opportunities for players seeking tournament action this past year. Hopefully it is a sign of things to come in 2018 as a wider variety of choices in terms of leagues and tournaments can only mean good things for the future of the game. Think about the best teams you saw on the field this year. How many of those teams have been together – with a majority of the same players – for more than one season? How many of those teams played in more than one organization in 2017? How many of those teams played in more than one tournament? The answer to all of those questions is probably a far smaller number than you might have initially thought. While the team unit has diminished in importance for the better part of the past decade, it reached a nadir in 2017. Just look at the major 2017 tournaments. The NWLA tournament – as it has always been – featured league All-Star teams most of which played together just one or twice last year. The Fast Plastic Texas Open included – at best – two full time teams (Frisco’s Master Batters and Rochester’s Freaky Franchise) and even those teams added some outside help. The GSWL Yard League Open also contained its fair share of cobbled together squads. If nothing else, at a national level there is less of a focus on teams then there are on players or even organizations than there has historically ever been. As such, naming the teams of the year for 2017 is a tricky task because there were very, very few that played in multiple places, faced a high level of competition, and fared well in doing so. Most of the 2017 teams listed below did not meet one or two of those criteria but did enough relative to their peers to be worthy of recognition. We are looking at true teams here – not squads put together for a single tournament. Unrestricted Pitch Speed, Base Running Team of the Year – WSEM Dads (Michigan): The Dads captured their 3rd NWLA Tournament title in 2017. While technically an all-star team, the key players have been together for several years in the NWLA tournament and their track record speaks for themselves. The NWLA tournament is clearly the class of these set of rules and thus winning that tournament gives any team a leg up for this honor. Unrestricted Pitch Speed, Non-base running – Palisades Giants (New York): While some might see this choice as controversial, the Giants stand out above the pack for winning as a cohesive team over the course of a full season. Led by the brothers McElrath, the Giants overcame a potentially crippling loss when Tim McElrath went down with an arm injury midway through the season. The Giants persevered, finishing the tough Palisades WBL regular season in second place before Ryan McElrath took over in the post-season pitching every single inning for his team while taking down such notable players like Rob “Wiffman” Piervinanzi, Jordan Robles, and the Torres brothers on their way to the championship. Medium (Yard) Pitch – State of Mind (New York): The veteran franchise picked up the biggest tournament win in their near-twenty years in the sport by winning the 2017 GSWL Yard League Open over 21 other teams in Staten Island this Summer. Additionally, State of Mind came in runner up to 10 Run Rule in the GSWL Yard New York championship. Those two top finishes, combined with the team’s longevity, are more than enough to make them deserving of this particular title. Slow Pitch – Cult West Warriors (Indiana): Winners of both a 48-team and 80-team slow pitch tournament earn this South Bend, Indiana team the top spot among slow pitch teams. If that wasn’t impressive enough, this was the second straight year the Warriors won the World Wiffle® Ball Championships and was the fourth year they captured the New Carlisle, Illinois Hometown Cup.